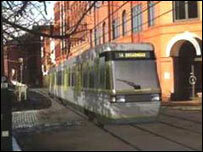 The controversial supertram project for the north of Bristol is to be officially dropped. The city's cabinet, meeting on 8 June, will be asked to formally end the council's promotion of the first stage of the project. The tram had been intended for the north of the city, linking Parkway Station with the city centre. Several routes that could be used for other kinds of rapid transit or public transport schemes will be safeguarded. Work will also continue with neighbouring authorities on a new Greater Bristol transport study. The results of this study would be brought forward for possible inclusion in new regional and sub-regional strategies and the updated Local Transport Plan when it is reviewed in 2005. Council leader Barbara Janke said: "Of course it would be sad to see the end of the ambitious scheme to deliver a tram link in the north of the city. "However, we need to be realistic and honest with people about its viability in the light of recent government statements and our own financial situation. "Now we have to get on with the job of finding other solutions. No one should underestimate the enormity of the task or pretend that we can reduce or remove congestion at a stroke." Severn Beach Rail Corridor; South Bristol, via Hartcliffe and Bedminster; East Bristol, via the former Bristol to Bath railway route; Portishead, via the Avon Gorge and North Bristol via the Parkway to Temple Meads rail corridor.